In 2000, local outsider artist Reb Roberts (and former owner of Sanctuary Folk Art Gallery), in collaboration with a handful of artists and community members, converged on the weather-stained front of the unused building at 710 Wealthy Street with buckets of paint and brushes. In the vacant windows, they painted — without permission from anyone — an aquatic scene with colorful fish, in Robert’s iconic style of bold lines and colors. This was just one year after local sibling entrepreneurs Jeff and Tami VandenBerg bought the nearby building which would become Wealthy Street’s iconic Meanwhile Bar. The year prior to that, the nearby Wealthy Street Theater opened as a community theater after being restored by the South East Economic Development Council. Just as the Meanwhile and Wealthy Street Theater became iconic entertainment anchors in this corridor, Roberts’ artwork, which lay along the walk of abandoned buildings near them, became an iconic part of the neighborhood’s visual aesthetic. In the nearly 20 years since then, the location of Roberts' fish artwork — between Henry and Charles — has become prime commercial real estate, as business is now booming along the Wealthy corridor. 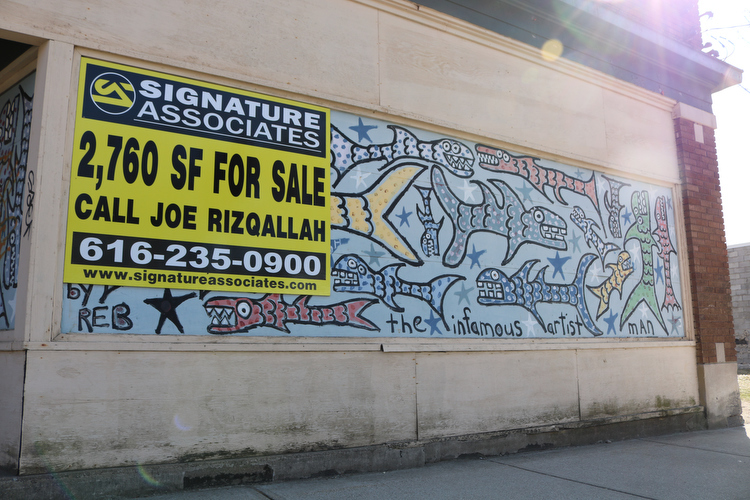 Today, a bright yellow commercial realtor’s sign covers a portion of the artwork. Indeed, Roberts’ artwork alone, in its megalithic and colorful style, dots the landscape of Grand Rapids and its surrounding neighborhoods far and wide, from electrical boxes in Easttown to empty signage in Belknap Hill to the gazebo ceiling of Heartside Park. 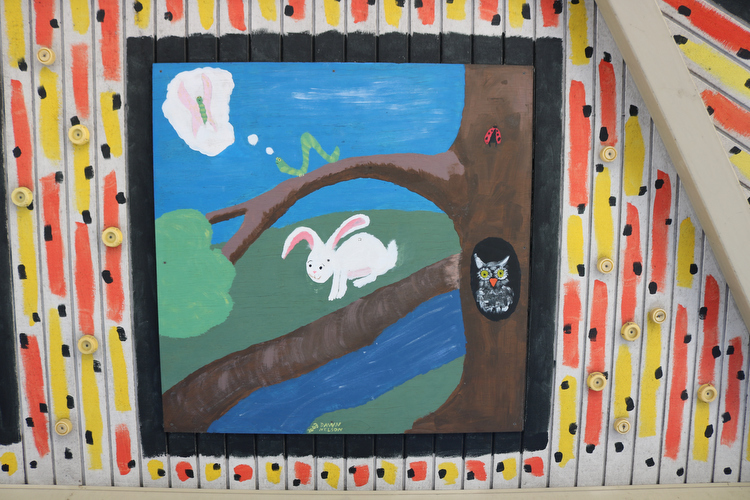 In more than 20 years, Roberts has completed over 200 collaborative art projects with local schools; youth, homeless, penal, religious, community, and city organizations; nonprofits; and businesses. 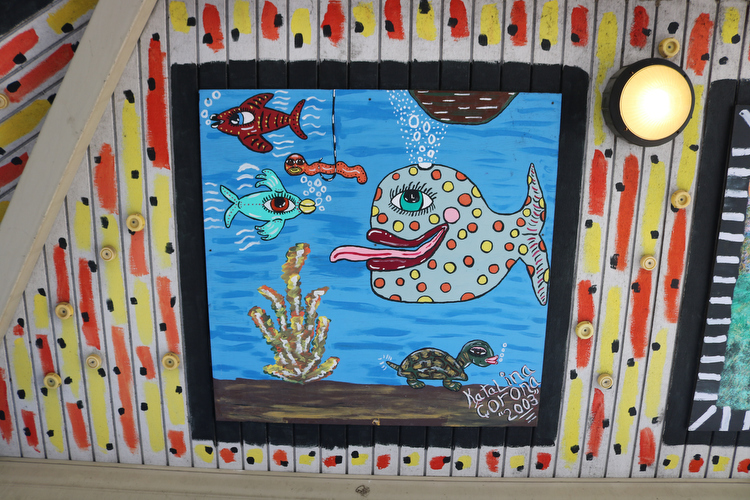 While many of these works have been covered, replaced, or otherwise torn down over the years, many others — like the fish paintings at 710 Wealthy Street — have remained. Yet making tactical art a collaborative process is key to creating a sense of ownership within the community, Roberts emphasizes. As evidenced by the plethora of outsider artwork within Heartside Galleries and throughout the Heartside neighborhood, tactical art which is collaborative can have the most powerful effect on its most long standing residents. 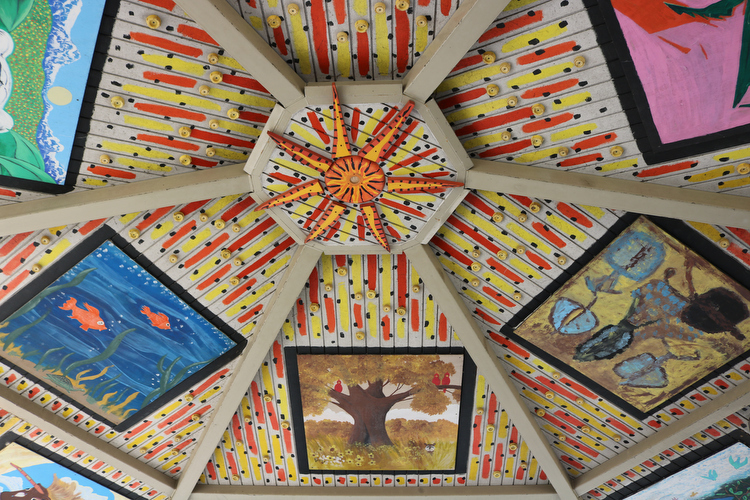 Dawn Nelson, one of the two dozen Heartside Ministries outsider artists who collaborated on the mural of the Heartside Park gazebo ceiling during its construction in 2003, visits the park every few days to check on her and her friends’ artwork. A longtime resident of Heartside, Nelson is currently without a permanent residence, and sometimes makes use of the services provided by the area ministries. 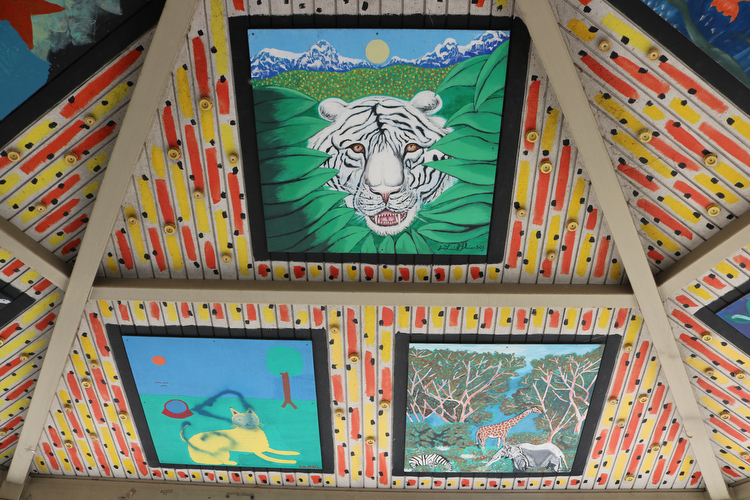 The ceiling of the gazebo in Heartside Park. “I felt really lucky to have been chosen as an artist to do this,” Nelson says as she gazes up at her artwork, noting that seeing her work here gives her a sense of ownership in the neighborhood. She points out several other paintings within the mural made by friends who have since passed away. Nelson, her fellow artists, and others in her community feel a sense of pride, and of protection over the park and the neighborhood, which bleeds through as Nelson bemoans the disrespectful way some locals treat the park, and how seldom the Downtown Ambassadors are able to patrol the area to keep it friendly for families. Still, children from the nearby Bethlehem Lutheran Intergenerational Center routinely makes use of Heartside Park’s playground and splash pad during warmer months, protected by locals due to their status and experience as Heartside locals, and buffered by the energy of Nelson’s artwork, and others'. “They paid me 50 dollars for that painting,” Nelson recalls with pride, and with a breath of gratitude. This, notes Roberts, is an important aspect of collaborative tactical art — one which he’s fought to keep a part of his projects countless times. “Compensating artists is really important; it creates literal financial value within a community’s portfolio,” Roberts says, pointing out the fact that the measure of art’s financial value lies in people’s willingness to pay for it — a fact that’s well known, but seldom discussed outside the folk art community. By choosing to financially invest in local art made by local artists, patrons are literally increasing the financial value of the neighborhood — and of the reputation of the artists themselves. As one of the city’s early tactical artists in the ‘90s, Roberts and his peers created art in Heartside and downtown neighborhoods when they were ghost towns. Now, they’re bustling with activity and new development — and a new aesthetic. Yet Lott insists that when it comes to urban development, permanence is only ever an illusion. As an architect, Lott points out, once his projects are finished, he completely relinquishes control, and puts the fate of the buildings he’s designed into the hands of the owner. And sometimes that means watching your projects get torn down. Lott’s zen-like stance calls for conversations with greater nuance, and a laying aside of arbitrary morality and ideas of permanence. “I think I just coined urban buddhism,” Lott says. 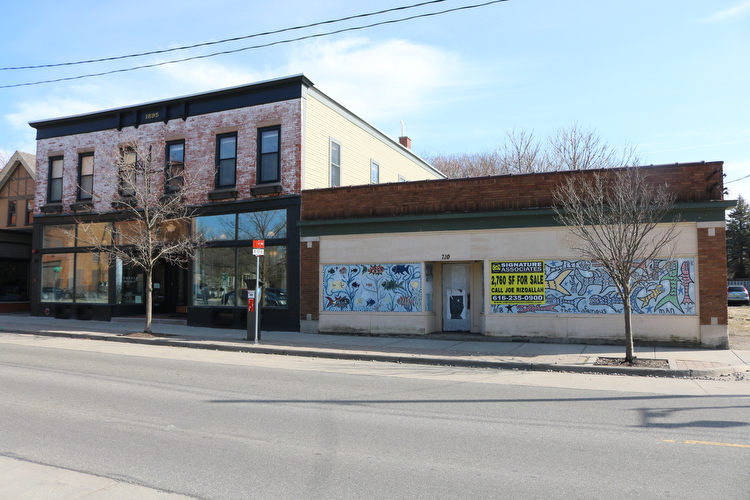 He’ll have ample space to put his zen-like attitude into practice this fall, when Lott and SiTE:LAB founder Paul Amenta will be curating another temporary “architectural intervention” for ArtPrize’s curated Project 1. Meanwhile, Roberts is more focused on claiming our identity as a city, and as individual neighborhoods, than he is on rallying to protect his now historic artwork. Roberts looks towards the investment Downtown Grand Rapids, Inc. is doing in artwork across downtown neighborhoods, and contrasts it to that of still neglected areas and neighborhoods outside of DGRI’s economic investment radius, like South Town, the corner of Cass and Hall, or Jefferson and Franklin. “Let’s sprinkle some of that holy water outside the church,” Roberts says. “Let’s hear the enthusiasm we have for downtown applied to the rest of the city — taken into other neighborhoods.” Referencing DGRI’s recently sponsored silent disco downtown, Roberts suggests an idea could be expanded to hold simultaneous discos in Madison Square, South Town, et cetera. Details of implementation aside, it’s local artists, local collaboration, and genuinely free expression that Roberts is focused on.